Chromatin Signaling and Diseases covers the molecular mechanisms that regulate gene expression, which govern everything from embryonic development, growth, and human pathologies associated with aging, such as cancer. 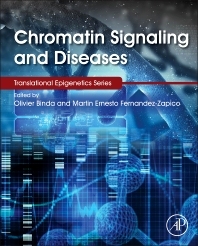 This book helps researchers learn about or keep up with the quickly expanding field of chromatin signaling. After reading this book, clinicians will be more capable of explaining the mechanisms of gene expression regulation to their patients to reassure them about new drug developments that target chromatin signaling mechanisms. For example, several epigenetic drugs that act on chromatin signaling factors are in clinical trials or even approved for usage in cancer treatments, Alzheimer's, and Huntington's diseases. Other epigenetic drugs are in development to regulate various class of chromatin signaling factors. To keep up with this changing landscape, clinicians and doctors will need to stay familiar with genetic advances that translate to clinical practice, such as chromatin signaling. Although sequencing of the human genome was completed over a decade ago and its structure investigated for nearly half a century, molecular mechanisms that regulate gene expression remain largely misunderstood. An emerging concept called chromatin signaling proposes that small protein domains recognize chemical modifications on the genome scaffolding histone proteins, facilitating the nucleation of enzymatic complexes at specific loci that then open up or shut down the access to genetic information, thereby regulating gene expression. The addition and removal of chemical modifications on histones, as well as the proteins that specifically recognize these, is reviewed in Chromatin Signaling and Diseases. Finally, the impact of gene expression defects associated with malfunctioning chromatin signaling is also explored. Dr. Olivier Binda is a Principal Investigator at Newcastle Cancer Centre at the Northern Institute for Cancer Research, Newcastle University, Newcastle upon Tyne, England, specializing in epigenetics and gene expression as it relates to human disease. Dr. Binda co-edited Chromatin Signaling and Diseases (Elsevier 2016), a volume in Elsevier’s Translational Epigenetics series, and has published 20 scientific papers in such peer reviewed journals as the Journal of Biological Chemistry, Biochemistry, Epigenetics, Oncogene, Scientific Reports, and Stem Cell Research. In past positions he has served as a postdoctoral fellow at McGill University and Stanford University, and he completed his PhD in Biochemistry at McGill University in 2007. The research program of Martin E. Fernandez-Zapico, M.D., focuses on the cellular and molecular characterization of epigenetic pathways regulating pancreatic carcinogenesis, a dismal disease with one of the poorest prognoses among all neoplasms. Specifically, Dr. Fernandez-Zapico and his team study the modulation of chromatin and nuclear dynamics by oncogenic cascades and its impact in gene expression regulation, a critical step during pancreatic neoplastic transformation. Dr. Fernandez-Zapico and his team are confident that the knowledge derived from his studies will help with the understanding of the contribution of these epigenetic events to the initiation and/or progression of pancreatic carcinogenesis as well as serve as a foundation for the development of new therapeutic approaches. Dr. Fernandez-Zapico's program is affiliated with the Mayo Clinic Cancer Center, Department of Oncology, Division of Gastroenterology and Hepatology, and the Center for Cell Signaling in Gastroenterology. His research is supported by the National Institutes of Health (NIH), the NIH-funded Mayo Clinic Pancreatic Cancer Specialized Program of Research Excellence (SPORE), the NIH-funded Mayo Clinic Center for Cell Signaling in Gastroenterology, and the Leukemia and Lymphoma Foundation.